"Team of Teams, Creating Tomorrow's Today"
Brooke Army Medical Center (BAMC) is the United States Army's premier medical institution. Located on Fort Sam Houston, BAMC, a 425-bed Academic Medical Center, is the Department of Defense's largest facility and only Level 1 Trauma Center. BAMC is also home to the Center for the Intrepid. The center is composed of ten separate organizations, including community medical clinics, centered around the Army's largest in-patient hospital. BAMC is staffed by more than 8,000 dedicated Soldiers, Airmen, Sailors, Civilians, and Contractors dedicated to providing outstanding care to wounded Service Members and the San Antonio Community at-large. Brooke Army Medical Center has a history which dates back to 1879 when the first Post Hospital opened as a small medical dispensary located in a single-story wooden building. During the early years the Post Hospital was in temporary structures, and it was not until 1886 that the first permanent hospital was built. In 1907 an 84-bed Station Hospital was constructed on the west side of the post. In 1941, the Station Hospital prepared for an overwhelming flow of casualties from World War II battlefields by converting a 220-person enlisted barracks into additional patient wards. In 1942, the Station Hospital was renamed Brooke General Hospital in Brooke's honor. In 1944, BAMC converted a Cavalry Battalion barracks into a convalescent unit to accommodate the flow of casualties from the war. This building later became Beach Pavilion. Beach housed a substantial portion of BAMC assets to include patient wards and specialty clinics. 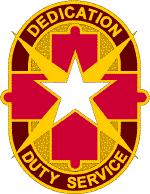 In 1946, Fort Sam Houston was chosen as the new site for the U.S. Army Medical Field Service School. The decision to centralize the Army's medical research and training at one location resulted in the renaming of Brooke General Hospital to Brooke Army Medical Center. In September 1987, the official groundbreaking took place for the construction of a new hospital. Folding the US flag at the BAMC main entrance in 2005. On July 18, 1995, ownership of the replacement hospital was given to the BAMC Commander by the U.S. Army Corps of Engineers during the key turnover ceremony. On March 14, 1996, the new facility was officially dedicated and on April 13, BAMC opened for business with the transfer of inpatients from the "old" BAMC to the "new" BAMC. Today "old" BAMC is home to United States Army South and a number of smaller units. Because of the 2005 Base realignment and closure, Brooke Army Medical Center's inpatient absorbed those of the Air Force's Wilford Hall (Wilford Hall no longer provides inpatient care) creating San Antonio Military Medical Center (SAMMC) on September 6, 2011. As of 1 Oct 2017, the designation SAMMC was removed and BAMC continues to represent the headquarters that serves as the command for the entire hospital along with the medical clinics on Fort Sam Houston, others in the San Antonio area, and one at the Army Depot in Corpus Christi. The collaboration between BAMC and local Air Force Medical assets are governed by the San Antonio Military Health System (SAMHS). San Antonio Military Medical Center (SAMMC) — the inpatient capabilities at Brooke Army Medical Center (BAMC)— is situated at Fort Sam Houston, San Antonio, Texas, and is part of the U.S. Army Medical Command (MEDCOM). BAMC is the command element over all Army medical facilities in the San Antonio area, including SAMMC (SAMMC is no longer the term used; BAMC is the name of the hospital and is responsible for the administrative and clinical oversight of the Army healthcare facilities in San Antonio). The term SAMMC solely applies to the inpatient capabilities within the hospital at Brooke Army Medical Center (BAMC). The hospital as a whole as well as the outlying clinics are considered BAMC. It is a University of Texas Health Science Center at San Antonio and USUHS teaching hospital and is home to the U.S. Army Institute of Surgical Research Burn Center. The USAISR Burn Center is part of the U.S. Army Medical Research and Materiel Command located at Fort Detrick, Maryland. The hospital today is a 425-bed Joint Commission-accredited facility, expandable to 653 beds in the event of disaster. Services include general medical and surgical care, adult and pediatric primary care clinics, 24-hour Emergency department, specialty clinics, clinical services, wellness and prevention services, veterinary care, and environmental health services. BAMC is the only MEDCOM Level I trauma center in the United States, and is part of the Regional Health Command Central (RHC-C). The old BGH building (1937) was added to the National Register of Historic Places on November 30, 2001. Under BRAC 2005, BAMC will expand its inpatient services as those services are relocated from the 59th Medical Wing, Wilford Hall Medical Center (USAF). The Nuclear Medicine service is one of the first to completely integrate operations, and offers PET/CT, SPECT/CT, and other molecular imaging and therapy services. To accomplish the realignment of inpatient services and related specialty care from Wilford Hall Medical Center (WHMC) to Brooke Army Medical Center (BAMC) as presented in the BRAC 2005 scenario, BAMC will undergo the construction of a consolidated tower, a parking facility, a central energy plant, and renovations within the existing facility. Construction began in March 2009 on the nearly 738,000 sq ft (68,600 m2) project. CoTo was added on the east side of the facility adjacent to the clinical building and medical mall. This addition houses administrative space, an outpatient pediatrics clinic, an expanded Emergency and Trauma department, a SICU, a CCU, a psychiatric unit, and an expansion of the USAISR Burn Center which has 16 Burn Intensive Care Unit beds and 24 Progressive Care beds. SAMMC will serve as a health science center for inpatient and ambulatory care, consisting of training for Graduate Medical Education (GME), a Level 1 Trauma Center. The USAISR Burn Center is the only American Burn Association verified Burn Center within the DoD. Construction began in March 2009 on a multi-level, 5,000-space parking structure to accommodate the increased capacity at the upgraded medical facility. Due to the size increase in the BAMC facility, additional heating and cooling capacities are being provided with a 22,400-square-foot (2,080 m2) central energy plant, which is under construction. ^ "Brooke Army Medical Center Command Suite:". U.S. Army Medical Department. June 1, 2018. Retrieved June 6, 2018. ^ a b "History of Brooke Army Medical Center". U.S. Army Medical Department. July 30, 2015. Retrieved April 10, 2017. ^ "BRAC Information". Brooke Army Medical Center. May 23, 2012. Retrieved October 3, 2012. ^ a b "Details for Fort Sam Houston". Texas Historic Sites Atlas. 2015. Retrieved April 10, 2017. ^ "Details for Brooke Army Medical Center". Texas Historic Sites Atlas. 2015. Retrieved April 10, 2017. This article incorporates public domain material from the United States Government document "Brooke Army Medical Center - SAMMC-North". "Hospitals At Fort Sam Houston" Fort Sam Houston Museum, 2006, a public domain work of the United States Government. Wikimedia Commons has media related to San Antonio Military Medical Center. This page was last edited on 21 January 2019, at 18:01 (UTC).